Samantha is my favorite doll, mostly because I look like her, and I love her story. She has pretty brown eyes and brown hair with bangs. Her story is set in 1904 during the Victorian era. Samantha lives with her Grandmary in a mansion in Mount Bedford, New York, where she met her best friend Nellie O’Malley. At the end of her book series, she moves in with her Aunt Cornelia and Uncle Gard, who got married the spring Samantha turned ten. American Girl recently brought Samantha back from being archived for several years. Her new collection includes an ice cream parlor, a bike, her aunt and uncle’s dog, Jip, her winter coat, her Christmas outfit, and a lot more! She comes with a pink dress that has white poke-a-dots on it and a red ribbon around her waist that ties in the back. She has a bow in her hair (it’s a pony tail with a bow on it – it’s easier to put in that way). The original Samantha came with a red and black checkered dress that had a ribbon that didn’t tie in the back. It went around the front and the ends crossed over each other in front with a gold buckle holding it together. She also had a matching hair ribbon. Samantha’s old book series starts with: Meet Samantha. The second book is: Samantha Learns A Lesson, her third book is: Samantha’s Surprise, the fourth book is: Samantha Saves The Day, and the last book is: Changes For Samantha. 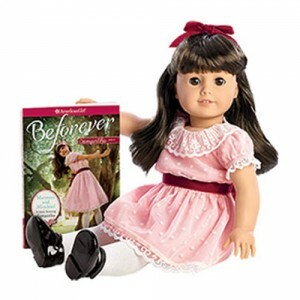 If you have the new BeForever books, the first one is: Manners and Mischief: A Samantha Classic One and the second one is: Lost And Found: A Samantha Classic Two. It is the same book series, but just put into two books. There is also a brand new Beforever book in the Samantha series: The Lilac Tunnel, where it’s like you are telling the story, and you could live like Samantha or discover what it would be like to be a servant in her time. She also has a movie: Samantha – An American Girl Holiday. It basically relays her story and adds a few details to it. For more of Samantha’s books, including fun mysteries, click Here. If you were rich during Samantha’s time period you might have changed your outfit four or five times a day, depending on your schedule. Now, you might think that changing your clothes is a very simple process, right? I mean all you do is throw a dress on. How hard can that be? But if you consider all that they wore – they wore: dresses, petticoats, stockings, gloves, hats, purses, boots, etc. – it would be extremely hard to change your outfit that often, even if you didn’t bother with the under clothes. You wouldn’t only change your clothes, you would probably change your hair style, too, and then you would probably change your foot-wear and gloves and, also, your jewelry. In addition, you might put on more perfume. But the wealthy ladies didn’t do this all by themselves; they had their maids help. Putting boots on sounds easy, but you would actually need a tool to help you called a button hook. Button hooks look like crochet hooks with a thinner top and fancy bottom. Why would you have a button hook? That is a good question, and I will answer it! Lady’s boots had more than eight tiny buttons on them, and it was too hard to do them all by hand, so they used a button hook to close them. Samantha would have worn petticoats, stockings, and bloomers under her dress, but the only thing any one actually saw was the stockings, shoes, and dress. Samantha’s play clothes and fancy clothes would have looked very much the same, but her fancy clothes would have been made with different material. If you were poor during that time period you would live either on the street or in a very small house with hardly any furniture. You would be hungry and cold all the time and would probably work at a factory all day from Monday to Saturday, only getting a break on Sunday. In the factory you would have to be very cautious. You would have to wear your hair short or risk it getting caught. Most poor people were immigrants, like Samantha’s best friend, Nellie O’Malley. Samantha retails for around $115 by herself, not including tax and shipping. 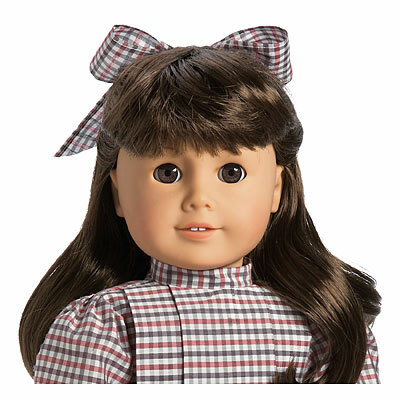 Click Here to see her on the American Girl website, and click Here to see her fun page.